I was joined for my ride today by my brother Major (retired) Angus and nephew Robert, who is studying Civil Engineering at University. Before heading off on route 72, or Hadrian's Cycleway, we had a hearty breakfast in Hexham. I also took an opportunity to look around Angus's hard work in the garden - although there didn't appear to be any gooseberries left. The weather today remained fine but slightly overcast - so no need for waterproofs again..
Angus and Robert in Corbridge market square. Corbridge is a jewel in the crown of Northumberland. It grew from the Roman town of Corstopitum, a supply town for the troops on Hadrian's Wall. In the thirteenth century Corbridge was second only to Newcastle in wealth and its citizens were heavily taxed to help pay for Edward 1's Scottish wars and its mediaeval street plan is much the same today. The bridge at Corbridge is the oldest of the mediaeval bridges which became derelict by the 17th century, and was finally replaced in 1674. The section of route 72 we followed follows the River Tyne through Corbridge, Bywell and Ovingham and Prudhoe - we decided to ride up on a short diversion to near the course of Hadrian's Wall high above Corbridge. The view was well worth it and we returned to the main trace through Newton to Bywell. We had some good fun although Robert did particularly well given the number of gears available on his bike was restricted to just a couple of high ones - in the above photo there are a couple of horses being caught up. After a good 12 miles or so we said farewell at Prudhoe where the cycle route becomes traffic free right along to South Shields. From Wylam to Newburn, the route follows the old North Wylam Branch Railway. The wrought iron Wylam Railway Bridge (1876), also known locally as Points Bridge, Half-moon Bridge, Hagg Bank Bridge, Bird Cage Bridge, or The Tin Bridge, is a footbridge and former railway bridge crossing the River Tyne at Hagg Bank. 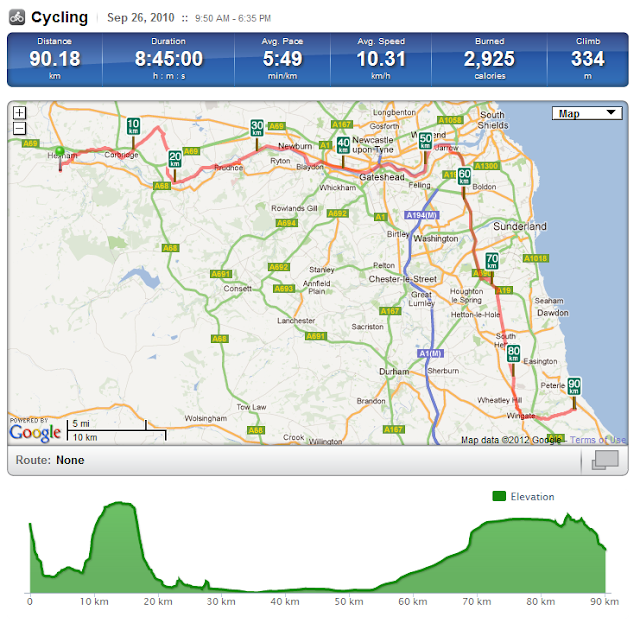 I recall cycling over this 28 years ago when I used to spend too much time in and around the Boathouse Pub in Wylam. The 18th century stone cottage was the birthplace (June 1781) and home of rail pioneer George Stephenson. It is owned by the National Trust and is situated along the waggonway (correct spelling) some 0.5 miles east of Wylam Railway Bridge. I enjoyed the rest of the journey into the heart of the Quayside districts of Newcastle and Gateshead. There were a lot of people out on their bikes and enjoying the sunshine and the market in and around the many bridges. Gateshead Millemium Bridge opened September 2001 and cost £22m to build by Volker Stevin. It was conceived and designed by architects Wilkinson Eyre and structural engineers Gifford. The bridge is sometimes referred to as the 'Blinking Eye Bridge'. I continued to follow route 72 towards the coast, seeing the huge Duco and Shepherd offshore facilities down towards Swan Hunters and other famous names of the past ship building heritage of the lower Tyne. It also looks like good progress has been made in constructing the new and second Tyne Tunnel at Jarrow. At this point I turned to the south and headed towards a place near Castle Eden south of Peterlee. The old Caste Eden brewery is now an Italian restaurant although I didn't stop to see if the food was a good as the beer. The quality of the signage and paths of cycle ways deteriorated significantly near to Hetton-le-Hole. Unfortunately it was around this time that I lost a spoke on the rear wheel, just next to the chain block for those who know, and I couldn't fix it my the side of the road. In the end I limped in to my accommodation, near to the sea, rather tired and exhausted at 18.30 after a great ride earlier in the day. Tomorrow I'll need to sort it all out and perhaps lose some weight from the bike (thanks Angus for the observations and advice - you were right!). A day to gladden a pontist's heart. Sorry to hear about the broken spoke. I can't even fix one on the front wheel without assistance - a gap in my knowledge that I really should sort out some time!